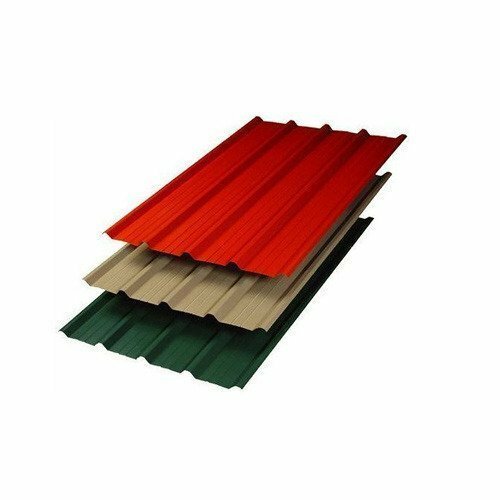 Color Cladding Sheets finds applications in false ceilings, airports, malls and many other places. Lightweight but strong, these sheets ensures dependable performance in all-weather conditions. Our range is available in trapezoidal shapes, big corrugation sin and wave-small corrugation. These sheets are very durable conditions and are very easy to install. Curved shaped, we made these available to the clients in various colors and dimensions. These sheets are made up of galvanized steel and aluminum. Founded in the year 2010, we, “Pushpak Infrasteel Private Ltd.”, are counted as the leading organizations engaged in manufacturing, supplying and distributing a wide range of Galvanized Sheets. Our parent company incorporated in year 1987. We developed our products under the strict guidance of our experts and we never compromise on the quality of the products. Our offered range is highly demanded among the clients for the salient features like weather resistance, high efficiency, easy installation, corrosion resistance, and longer service life. The superior quality of products offered from our end helps to fulfill the requirements of various industries and are manufactured as per the set industry guidelines. Our manufactured products are extensively demanded by railways, infrastructure projects, military, paper mills, chemical/fertilizer/petrochemical, glass, sugar factories, steel/metal industries, auto industry, textile, warehouse and many more. We own a sophisticated infrastructure unit, which covers a large area within our premises. Equipped with advanced machinery and hi-tech technology, our advanced infrastructure is segregated into different units namely, R&D department and warehouse and packaging manufacturing unit. Owing to these factors, we are holding a strong reputation in the national and international markets and have gained the trust of many clients. Under the guidance of our mentor and proprietor, 'Mr. Pritesh Baldota', we have been able managed a strong reputation in our domain. He has years of experience in this industry and huge business experience that has enabled us to achieve our organization’s goals in a structured manner.